Best equity mutual fund plans to invest in India for gaining higher returns in the long run. Mutual funds are the best investment options these days, and recording new heights in terms of generating returns. If you see the growth graph of the past five years, it can clearly be understood that how aggressively the industry has moved upward. So, what are you waiting for? If you have any interest in creating wealth in the long-term period, then the schemes which are mentioned in the above table are among the best solutions. All these schemes have proved their high potential in generating excellent returns in the long run. You can choose any one which suits the most to your investment objectives. The category wise distribution and the risk nature are also shown in the table so that you can easily determine which one of them is the best for you. Mark Your Investment Goal: It means that you need to make a clear vision of your financial objectives. Know what exactly you want to achieve and in what time! After that choose the most appropriate investment plan which has the potential to help you in reaching attaining your targets. Don’t Think it’s Late: Never make the age factor an issue. Yes, it is true that an early investment can reap you unrealistic benefits, but it is also never said that latecomers would achieve nothing. Therefore, forget about the age factor and start investing today. You may further lose the possible benefits, if you still waste your time in thinking!!! Don’t Stick to One Category: Try making diversification in your portfolio, unlike the one who invests only in a single category of fund. A well-diversified investment portfolio can help you maintaining stability in returns and reducing the risk. Stay Invested for the Long Term: You must have heard from the experts saying that equity funds can help you in earning millions when you stay invested for the long-term period. It is cent percent true, but the only thing you need to do is stick to your investment. Don’t Become Greedy for Short-Term Hikes: Sometimes, it has been seen that the investors become greedy for the sudden ups in any particular market without knowing the fact that it is not going to sustain for long. You need to take care of such things, and always prefer consistency if you want to earn healthy benefits. On the final note, it is suggested to invest in equity fund investments and don’t be like a day dreamer! 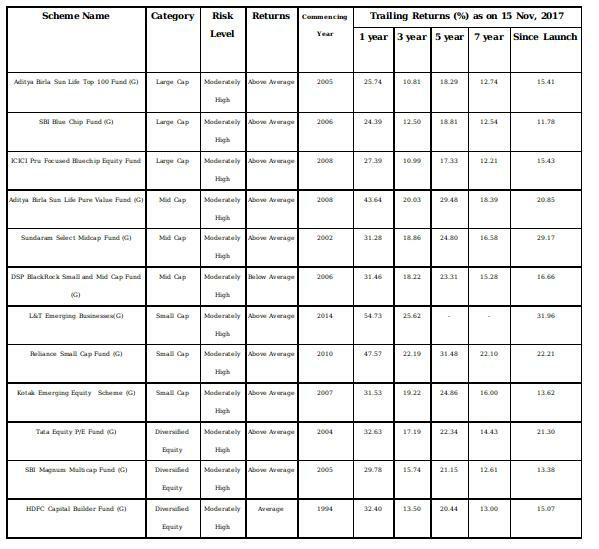 If you see the long-term returns provided by the schemes which are mentioned in the above tables, on an average they provided 10-16%. So, don’t make false expectation like earning 40% or 50%, and have a clear vision based on the real facts.